1st Lt. Flournory L. Choate, Jr., son of Mr. and Mrs. Flournory L. Choate, attended Tipton High School and Okla. Baptist Univ. ; husband of the former Alyce Joyce Cox. Entered Air Corps in Feb. 1943, trained in Jefferson Brks., Columbia, Mo., San Antonio, Texas, Okla. City, Enid, Altus Okla., Dodge City, Kan., Lake Charles, La. 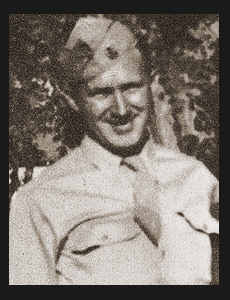 ; served in England, France, Holland, Belgium, Germany where he was killed in action in Sept. 1945. Awarded Good Conduct Medal, ETO Ribbon with four Battle Stars, Air medal with four Oak Leaf Clusters, Pres. Unit Citation, DFC.